After being shipwrecked, a man finds himself on an island inhabited by tiny people, who soon make plans for him. A farmboy turned knight must protect a princess from the schemes of an evil wizard. The legendary Greek hero leads a team of intrepid adventurers in a perilous quest for the legendary Golden Fleece. The Munsters travel to England after Herman discovers he's the new Lord of the Munster Hall. Dr. Lemuel Gulliver: ...you don't need Reldresal or me to fight a war! Emperor of Lilliput: Of course I don't need a prime minister to fight a war! But I need one to blame in case we lose it. 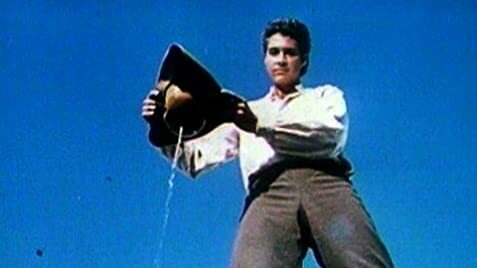 A poor Englishman doctor called Gulliver (Kerwin Matthews) has adventurer plans , so nothing keeps him in the little town he lives , not even his girlfriend Elisabeth (June Thornburn) who wishes to marry him . He signs on to a ship to India in spite of objections his beautiful fiancée . But in a storm he's washed ashore and discovers a fantasy land of small inhabitants called Lilliput in the East Indies where everyone is about two inches tall . Later on , he managed to convince them he's harmless and is accepted as one of their villagers , but their king wants to utilize him in war against his enemies . After that , Gulliver goes to land of Bobdingnag where inhabits giant people . The highlights of the movie are the great visual effects by craftsman Ray Harryhausen , including his ordinary monsters using his customary system Dynamation . After three sci-fi monster films such as The Beast from 20,000 Fathoms , 20 Million Miles to Earth , It Came from Beneath the Sea and work with Willis O'Brien in Mighty Joe Young and on an Irwin Allen documentary titled : The animal world , Harryhausen did the effects work for The 7th Voyage of Sinbad or Sinbad and the princess (1958) also starred by Kerwin Matthews , his first split-screen film shot entirely in color, which was highlighted by Harryhausen's mythological monsters interacting with actors . Because Harryhausen worked alone on his stop-motion animation sequences, the filming of these could often take as long as two years, the most famous example of the kind of patience required being the exciting skeleton sword fight sequence in his most popular film Jason and the Argonauts (1963) in which Harryhausen often shot no more than 13 frames of film (one-half second of elapsed time) per day . 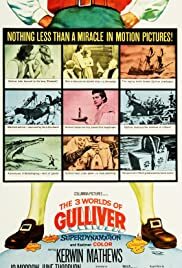 The 1960s were Harryhausen's best years, among the spotlights being his reunions with dinosaurs and other creatures in Hammer Films' One Million Years B.C (1966) , The Valley of Gwangi (1969) , Mysterious Island (1961) and this The 3 Worlds of Gulliver (1960) . His pace slowed in the 1970s, but he produced three of his masterworks during that period : The fantastic voyage of Sinbad (1973); Sinbad and the Eye of the Tiger (1977) and Clash of Titans (1981). Other versions about this immortal novel are the followings : ¨Gulliver's travels¨(1939) by Max and Dave Fleischer , being an animated retelling ; ¨Gulliver's travels¨(1977) by Peter Hunt with Richard Harris , Catherine Schell , in which real life and cartoon mix in a three-dimensional tale ; TV adaptation (1995) by Charles Sturridge with Mary Steenburgen , Edward Fox , Peter O'Toole , Edward Woodward , Ned Beatty , in which Gulliver/Ted Danson is confined in Bedlam insane asylum after being lost at sea for eight years and he relates his odd adventures in the tiny land and among the giants and the silly and impractical intellectual of Laputa . And recent comical recounting (2010) by Rob Letterman with Jack Black , Jason Segel , Emily Blunt and Amanda Peet .